Sunscreen is, above all, the most important aspect of your skincare regimen. We’ve all heard it so many times by our primary care physicians, dermatologist and plastic surgeons. They’re not lying! A broad-spectrum sunscreen must be applied every morning to prevent future damage. Choose one that has zinc and titanium dioxide to ensure adequate UVA and UVB protection. Topical antioxidants are also an amazing addition to your anti-aging skincare routine and will help everyone at any age. In addition to a great preventative skincare routine, monthly microdermabrasion treatments or light chemical peels are great to assist in the penetration of active topicals. 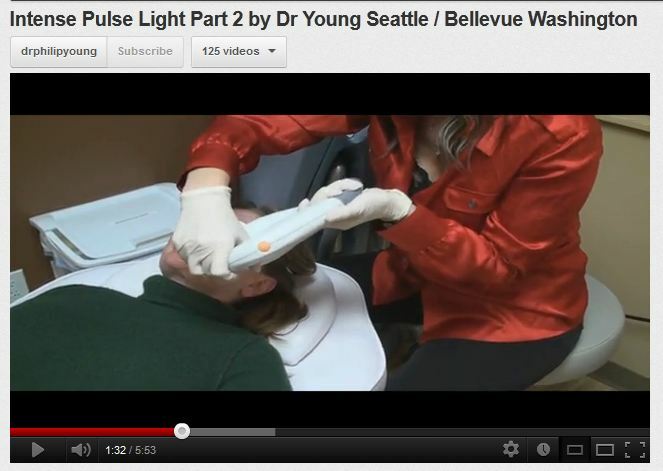 If you have any questions or concerns regarding which products or treatments are best for you, feel free to call us anytime at 425-990-3223 or find us on our website www.drphilipyoung.com. 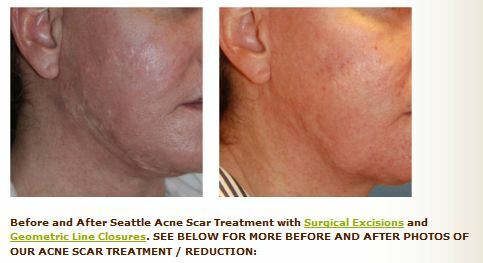 Seattle Acne Scar Treatment Webpage Released by Dr. Philip Young: We have made a new webpage on Seattle Acne Scar Treatment on our website www.drphilipyoung.com. We added some new pictures / photos and some links to help people understand a little more about how we are treating scars that were created by Acne. We would also like to explain a little about our thought process when it comes to treating Acne Scars. Acne is a process that can affect all layers of the skin. The process originates from the hair follicle. The hair follicle depending on the point of the growth cycle that it is in will have a certain length that it goes in the skin. At times, the hair follicle will be very deep and sometimes less deep. The point is that when acne erupts, the process can extend deep into the skin and affect all the layers even the area deep to the skin. When scars form from Acne, they also affect all the layers of the skin. So the scarring is really pervasive. That makes treating acne difficult as well. When it comes to excisions, acne scarred skin is less pliable and it doesn’t stretch as much. This makes for a more difficult time with healing. Better results are harder to achieve. So you want to heal your skin. We believe that you have to prep the skin before you actually do other things like excisions, subcisions, punch grafting, flap reconstructions, and deep chemical peeling. We have a 3-4 step process that we like to do for people. It entails 1. tissue grafting, 2. more invasive work such as excisions, subcisions, deep chemical peeling, punch grafting, flap reconstructions, 3. More refinement, 4. co2 laser resurfacing and dermasanding. Our goals are to heal the skin first, treat the skin with more invasive procedures to get the scarred skin to the same level, repeating the second step until the goals are reached, then refining our results with a polishing technique that entails co2 laser resurfacing and dermasanding. You can go through our webpages with this in mind to better understand what we are aiming to do. We have topics on depressed white acne scars, box car scars, elevated white acne scars, pock mark acne scars and more. Epidermoid cyst removing them without a scar by Dr. Philip Young of Bellevue? Epidermoid cysts occur when there is some event that causes the hair follicle or pilosebaceous unit to become clogged and then the lining of the hair follicle starts to grow and form a cyst or pocket that goes into your tissues. I am unaware of removing them without a scar. Usually the best way is to excise the lesion to get rid of them. There are ways to make the incision look better. Posted in Acne Scar Treatment, Mole / Skin Lesions / Cyst Removal, Scar Removal / scar reduction / scar revision / scar treatment, Skin Care / Intense Pulse Light | Comments Off on Epidermoid cyst removing them without a scar by Dr. Philip Young of Bellevue? Cleaning your incisions after any procedure that requires suturing. This is a blog to discuss how to clean your incisions after any surgical procedure. The key for healing is to remove all crusting and to start with an incision that has the skin edges as close as possible together. The crusting is important to remove because the crusts can be nourishment for bacteria that can proliferate and cause more scarring. I usually suggest to my patients that they use vinegar and distilled water in a 1:3 dilution to clean the incisions. I tell people to do this twice a day. The goal is to get there incision to look like a fine wrinkle. If they keep doing this during the first 2 weeks the incision has the potential to heal incredibly. Always have vaseline over the incisions. It has been scientifically shown that skin cells grow faster when they have two surfaces to grow on. The vaseline serves as the other surface and this promotes the healing. 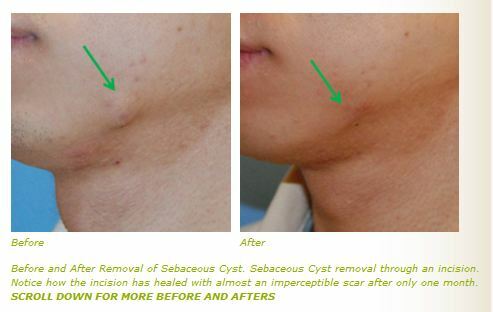 You want the skin cells to grow over the incision as fast as possible. This reduces the scarring. Some people advocate hydrogen peroxide. I would caution that the use of this can be risky. I use the same dilution with hydrogen peroxide and distilled water in a 1:3 dilution. The key with the use of hydrogen peroxide if you are going to take the risk is to use it sparingly. You just want to use it to take the crusting off and then stop. If you do this more than that you can have more scarring. So being conservative is very important. If in doubt don’t use the hydrogen peroxide. And if you do use it, do so for only the first week and that is it. You should continue to clean your incision for about the first two weeks and keep vaseline on the incision at all times. After this you can do regular skin care and use sunscreen during the day (approximately 12 hours) and then silicone gel during the evening for 12 hours. The silicone gel can be found at any pharmacy or drugstore, like Bartells. I would do the silicone gel for the next 3 months. It is one of the only things that have statistically shown to make a difference in preventing scarring. Vitamin E, aloe vera, mederma based on my knowledge and recent literature search (05 / 2010) does not make a scientific difference. Following up with your doctor is really important to do so that they can make sure that you are on the way to healing the right way! Posted in Scar Removal / scar reduction / scar revision / scar treatment, Skin Care / Intense Pulse Light, Uncategorized | Comments Off on Cleaning your incisions after any procedure that requires suturing. What are the options for Crows feet? Crows feet are due to the eye muscles that surround the eye. These muscles are meant to close the eye, to blink, to protect the eye, etc. When doing these movements, they can affect the skin around the sides of the eyes. What results with this movement are the wrinkles that are commonly called the crowsfeet. Botox is usually the way that people get some relief for them. It usually takes about 8 – 12 units of botox on each side and the costs are around 10-16 dollars per unit of botox. Other options include laser resurfacing, fillers, or fat injections for these wrinkles. Fat injections and fillers function to do the same thing. When we age we lose volume in the skin and in the whole face in general. What this does is bring the skin closer to the muscles of our face. When we were young, there was a greater distance from the muscles of facial expression and the skin. This distance was occupied by our skins fat and connective tissue. When you smiled when you were young, the muscles tended to glide under your skin. The fat in the skin above the muscles of facial expression allowed the skin to slide. This exact phenomenon occurs in multiple areas of your body. It is essential for muscle movement in fact. As we age, the muscles of facial expression become closer to the skin, when we progressively lose the fat and connective tissue within and under the skin. Hence, progressively when we smile are muscles of facial expression begin to exert more effects on the skin and these are manifested through wrinkling when we smile. Through fat injections, fillers, or the YoungVolumizer, this layer of fat between the skin and muscles is increased and the muscles of facial expression have less of a wrinkling effect on the skin. Resurfacing through chemical peels, lasers, or dermasanding / dermabrasion essentially takes away the top layers of the skin to allow skin cells deep within our hair follicles, glands etc to “resurface” the skin. In the process of the procedure, we remove wrinkles, create a new layer of collagen underneath the skin, remove unwanted pigmenation and DNA damage, remove precancerous or cancerous cells, etc. The skin then becomes renewed with healthier cells, you have less sun spots, wrinkles and the tone and texture of your skin is rejuvenated. I hope that was interesting for you! 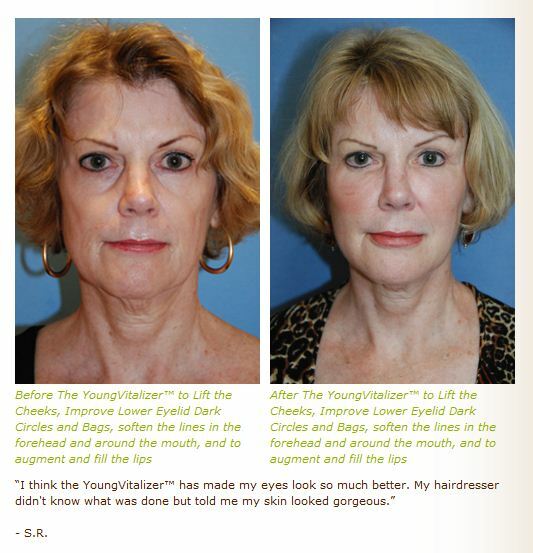 Posted in Botox, Dysport, Botulinum, Fat Transfer / Fat Injections, Fillers / Facial Fillers, Skin Care / Intense Pulse Light, Wrinkle Treatment, YoungVolumizer | Comments Off on What are the options for Crows feet?